Flight Day 6 was dedicated to the second spacewalk and continued assembly of the Dextre robot. The station and shuttle crews opened up and entered Japan's new Kibo logistics module during Flight Day 5. The first operational Delta 4-Heavy rocket launches the final Defense Support Program missile warning satellite for the Air Force. Using one of its final Delta 2 rockets, the U.S. Air Force continued a year-long launch surge of new Global Positioning System satellites with a successful blastoff from Cape Canaveral over the weekend. "About six months ago we began a challenging task of getting five modernized GPS satellites to orbit in less than a year. I'm pleased to say we're right on course," said Col. Jim Planeaux, Delta Group commander. A smooth countdown, interrupted only briefly by a passing rainshower that delayed fueling a few minutes, led to the Delta 2 rocket thundering away from its Florida launch site Saturday at 2:10 a.m. EDT (0610 GMT). The $75 million GPS 2R-19 spacecraft rode the three-stage rocket into a preliminary orbit stretching 11,000 miles at its highest point and 100 miles at its lowest, then separated from the booster 68 minutes after liftoff while flying over the western Pacific. "Tonight's outstanding mission is the end result of a focused Delta 2 and GPS team executing a textbook launch campaign," Planeaux said. Launches of GPS satellites had become less frequent in the past couple of years, but that changed when the ongoing surge started in October with the liftoff of the GPS 2R-17 spacecraft, followed in December by GPS 2R-18. Faced with a projection that several of the aging satellites in the orbiting navigation network could soon fail, military officials last year ordered the remaining five current-generation GPS satellites be launched to replace the older craft. "We looked at this last year. Our staffs told us there was a potential for up to 9 (satellites) to fail on-orbit based on life of the vehicles -- most of these vehicles are 14, 15, 16 years old," said Col. Dave Madden, Global Positioning Systems Wing commander. "That's what drove us down this path of trying to get these five launched in one year." Since controllers have not experienced numerous failures of the aging satellites in recent months, the replacement launches are allowing the Air Force to put into service the new craft with their enhanced features and shift the old craft into backup roles as in-space spares to get the last bit of use out of the satellites. 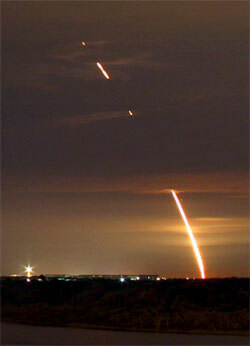 "Each time we launch one of these new satellites, the overall accuracy of the system goes up," Madden said. "We're hoping to build up our spare capacity and enable a stronger constellation." Going into Saturday's launch, the GPS constellation included 31 operational satellites and one spare. The system is capped at 31 operational craft in service at any one time. "We can't transmit any more than that without fear of affecting user equipment across the world," Madden said. "We've been doing a lot of testing to figure out how high that number can go. But right now we know that 31 is as far as we can go. So we will maintain the strongest 31 (satellites) we have on-orbit and the other ones will be put into a spare capacity just in case we have to take a vehicle offline." That means when the GPS 2R-19 satellite completes testing and enters service in a few weeks the 15-year-old craft it is replacing will become the constellation's second available backup. Launched in September 1992 with a seven-year design life, the GPS 2A-15 satellite will give way to the new 2R-19 craft in the constellation's Plane A, Slot 4 position. "We look forward to conducting another timely and efficient on-orbit checkout so that the warfighter and civil users around the globe can benefit from this satellite's advanced navigational capabilities as quickly as possible," said Don DeGryse, Lockheed Martin's vice president of Navigation Systems. The orbiting network emits continuous navigation signals that allow users to find their position in latitude, longitude and altitude and determine time. 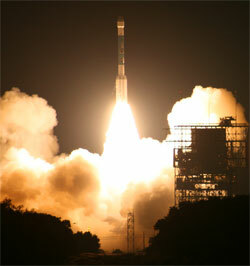 The satellite launched Saturday is the sixth in a series of eight that include modernized features. The upgraded satellites transmit additional signals and are equipped with improvements aimed at greater accuracy, tougher resistance to interference and enhanced performance for users around the world. The new civilian signal removes navigation errors caused by the Earth's ionosphere. The military advancements will provide a more robust jam-resistant signal and enable better targeting of GPS-guided weapons in hostile environments. "The GPS constellation is being modernized to improve operations, sustainment, and overall performance of GPS services for the warfighter, international, commercial and civil users. These improved capabilities ensure GPS remains the gold standard for positioning, navigation and timing service," Madden said. Two more modernized satellites in the Lockheed Martin-built Block 2R series are waiting for flight. Those launches -- currently targeted for June 30 and Sept. 11 -- will use the Air Force's final two Delta 2 rockets in inventory. "We're currently in pretty much nominal flow processing those launches. For the boosters, most of the hardware is still at the factory but will ship in plenty of time to begin integration at the launch site. (It's) looking like nominal campaigns with the usual margin we have. So we're confident we'll meet those schedules," Planeaux said. The Air Force hopes to perform both of its remaining Delta 2 rocket launches before the government's fiscal year ends Sept. 30. "We budgeted to launch them this year and it always works best when you execute your program milestones in the year that you budgeted for them. But that's not a show-stopper. It's harder to get money in the next fiscal year, but it's not something that will cause any great issue with getting the launches off," Planeaux said. "There is no hard deadline...We'll launch these missions when we're ready." The satellite slated to be GPS 2R-21 has been delivered to the Cape while 2R-20 remains at its manufacturing plant being outfitted with a new civilian signal demonstration payload before its shipment to Florida in early April, Madden said. 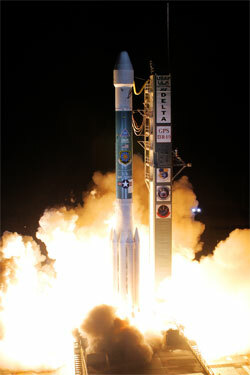 Beginning in early 2009, the next-generation GPS 2F satellites built by Boeing are scheduled to start launching. Those craft will rely on Atlas 5 and Delta 4 rockets for the ride to orbit.